Your Min Pin will need plenty of protein to keep up muscle tone and quality carbohydrates to account for energy. They don’t eat much, but the food you choose should be suitable for small breeds and their smaller jaws. It may also be necessary to switch to wet food. Miniature Pinschers pack a ton of personality into a small body, and they need the nutrition to keep up. They’re fearless and fun-loving but will require some care as they age because they can live for a long time. They have a high stepping gait and plenty of energy. They offer families loyalty and would be very protective were it not for their tiny size. They need densely nutritious food because they don’t eat much and you don’t have much to waste on empty calories. Make sure what you feed them uses premium ingredients, and they’ll reward you with wonderful companionship. Your Pinscher doesn’t eat that much. You don’t have much space to have empty calories so it’s essential that you pack as much as you can into a small serving size. A quality food helps keep weight under control and gives your Pinscher all day energy even with such little portion sizes. Pinschers are overall very healthy, but they are prone to a few different conditions. Let’s take a look at what sort of things you might need to keep an eye out for. Smaller dogs are prone to weaknesses in their knees, causing the kneecap to pop out of place. Most of the time they pop back into place, but it can cause some issues in the overall movement. Make sure you have a food with protein to support muscle tone and the supplement glucosamine and chondroitin to keep those joints in better condition. Miniature Pinschers are prone to eye issues because of their size and eye prominence. It can be helpful to have complete nutrition to help with soft tissues and nervous system health. You may not be able to avoid these issues, but quality food can help mitigate the effects. You can’t avoid hyperthyroidism if it’s in your dog’s genetics, but a healthy diet can help mitigate the effects. Your dog can live a healthy, long life with the right treatment plan and quality foods that support the body and its systems. Protein needs to be the first ingredient on the list, and it should come from sources that are quality. Look for specifically listed meats such as “whole deboned chicken” for a quality protein source. Combine those proteins with complex carbohydrates for all-day energy. Fruits and vegetables are excellent sources of vitamins and antioxidants, which support critical functions and offer support from puppy years to senior years. Other supplements such as glucosamine and chondroitin help keep joints healthy while essential fatty acids keep skin healthy. If your Pinscher has allergies, it can be helpful to switch to a limited ingredient formula that uses a single protein source and a handful of other ingredients to ease digestion and reduce inflammation. Cheap fillers such as corn and soy offer no nutritional benefits and shouldn’t be listed anywhere in your dog’s ingredients’ list. They only add empty calories and can’t provide nutritional value. Look elsewhere. Unspecified meats and by-product meals offer cheap proteins that aren’t verified. Also, artificial flavors encourage your Miniature Pinscher to eat too quickly and too much. Artificial colors are only there to make you feel like the food is healthier than it is. Avoid all these, also. 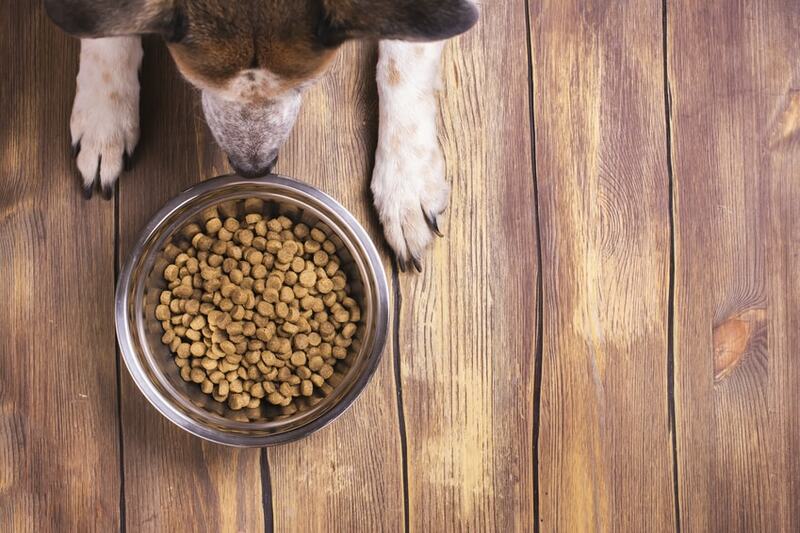 Many dog owners are switching to a grain free or gluten free food, but a worrying link between common replacement ingredients potatoes, peas, and legumes and an enlarged heart. You should talk to your vet about possibly avoiding these ingredients altogether or at least when they’re listed in the first two or three ingredients. We know that these brands are often touted as affordable foods to give your dog, but in reality, they can have detrimental effects on your dog’s long term health. Let’s take a look. Alpo: Both the wet and dry foods have cheap fillers and artificial ingredients. It can affect your dog’s digestion and cause issues if your dog has any allergies. We recommend avoiding Alpo. Kibbles And Bits: This one is full of artificial colors and flavors plus so many empty fillers. In fact, there are very few upsides of Kibbles N Bits aside from the price. Run far away. Pedigree: There’s a healthy dog on the front, but that’s about it. It has plenty of ingredients that don’t offer nutritional value and overall, it just doesn’t help your dog live a long healthy life. Stay away. Pinschers are going to eat a lot less food than you might think. Many owners feed their Pinschers to obesity, which can cause lifelong problems. It’s important to talk to your vet about how much to feed your individual Pinscher, but here are some basic tips. Puppies: Your vet will change portion recommendations a few times throughout maturation. Choose food made for small breeds so that it’s easier for your Pinscher puppy to chew. Adults: Adults generally get between a half cup and a full cup of food per day divided between several meals. That’s a half cup to full cup per day. Even though it seems like a small amount, any more could cause unnecessary weight gain. Seniors: Some seniors have teeth issues so it could be a good time to switch to wet food. Otherwise, your Pinscher will receive very similar nutrition as their younger counterparts. If there’s been weight gain, your vet may recommend a reduced portion size. Pinschers are adorable and the “king of toys.” Feeding your little companion a quality food can help you two have a great life together. Making sure protein is the first ingredient, and there are excellent supplements to maintain overall energy levels throughout the day. Our first food uses raw bits of meat freeze-dried added to small premium kibble that gives your Pinscher a protein. It’s grain free, but it uses a proper mix of complex carbohydrates to provide your Pinscher energy all day. It has glucosamine and chondroitin for joint support and plenty of essential fatty acids to keep your Pinscher’s skin healthy. Instinct By Nature’s Variety tries to mimic their ancestral diet. They use premium ingredients to create quality food that keeps your Pinscher in the best health. The company even donates a certain amount of meals to shelters to help get proper nutrition to all animals. Blue Buffalo’s small breed formula uses a grain free recipe to help pack in nutrition into smaller portion sizes. Chicken is a quality protein source with lean fat content and combined with complex carbohydrates, it helps keep your Pinscher happy and energetic all day. It all started with an Airedale Terrier named Blue. Now, Blue Buffalo takes the knowledge gained from finding the best nutrition for a family pet and brings it to your home with recipes designed to support health and wellbeing through premium ingredients. Ollies Healthy Turkey Feast uses a cooked food recipe to balance the dense nutrition of a raw diet with the convenience of kibble. Pinschers often have trouble consuming kibble, so this may be a good way for you to alleviate some tooth discomfort. It uses whole turkey plus fruits and veggies with complex carbohydrates to create a bowl you could practically eat yourself. Ollie creates cooked bowls for your Pinscher to enjoy using human grade ingredients. The meals are created in Ollie’s kitchens and delivered to your door ready to serve or refrigerate for later. They offer a variety of meals designed by trusted veterinarians and pet experts that can be ordered through their website. Pinscher puppies need plenty of quality protein to help their developing muscles along with guaranteed levels of calcium and phosphorus. This may also be an excellent time to use wet food by itself or as an additive to encourage little mouths to eat well. Merrick’s Lil’ Plates is specifically designed for small breed puppies and their unique mouth compositions. It has whole chicken for a quality protein source combined with low-glycemic sweet potato for 24-hour energy. Guaranteed levels of phosphorus and calcium help build strong bones while DHA encourages proper brain development. Merrick is a smaller, Texas-based company that uses only premium ingredients from local sources to create recipes suitable for your small breed puppy. They offer quality formulas to help encourage healthy growth and build a lifetime of wellbeing. If your Pinscher puppy has a hard time with kibble, a wet food like this one may be the answer. It uses turkey for a healthy protein source and lentils for a carbohydrate balance that’s grain free. It contains proper levels of calcium and phosphorus for bone development plus DHA for brain development. Nulo uses a holistic approach to dog food that helps puppies gain all the building blocks for lifelong health. Whole protein sources combined with a proper carbohydrate balance help your Pinscher feel full all day without overeating. Nulo’s ingredients are taken only from trusted sources and the company tests all recipes before releasing them to the public. Seniors need very similar nutrition as they did when they were younger, but some Pinscher seniors may have trouble chewing at this point. You could be looking at finding a different food that eases that discomfort while helping maintain weight and support joint and muscle health. Tylee’s uses human grade ingredients in a frozen mixture that mimics a homemade meal without the hassle. It uses whole proteins with a complex carbohydrate balance free of cheap fillers. Ingredients are minimally processed to preserve nutritional value, and it supports digestion, joints, bones, and muscles. Tylee was inspired by real pup, Tylee, and the quest for nutrition that would improve health and wellbeing. Each recipe is created by vets and pet nutritionists for a densely packed meal you can trust to be the best option for your pup. Now Fresh is specifically a weight control formula to help older small breed dogs bring down weight while supporting joints and muscles. It uses turkey, salmon, and duck for wholesome protein sources plus fresh fruits and veggies for essential vitamins and antioxidants. Probiotics help keep digestion regular while added L-carnitine helps support heart health. Glucosamine and chondroitin help keep joints supple, and it’s grain, gluten, and cheap filler free. Now Fresh uses only top quality ingredients in their recipes, creating foods that senior pet owners can trust to help keep those golden years full of life. They’re an independent, Canadian owned brand and use ingredients from trusted, local sources. They source none of their ingredients or supplements from China. Pinschers are excellent pets with plenty of personality in a small package. They don’t eat a lot, but what they do eat needs to be quality food to provide nutrition. Foods with empty calories can add a lot of unnecessary weight, even a few ounces of which can have detrimental effects on health and well-being. Giving your Pinscher the right mix of nutrition can help build proper growth during puppyhood that continues well into adulthood. Issues with joints and weight could be problems, but diet can help mitigate these effects without being a hassle. Even dental problems that could prevent your Pinscher from consuming most normal dog foods can be solved with many of the options on our list. The right balance of nutrients helps keep your Miniature Pinscher in top condition throughout its (possibly very) long life and gives you quality time together for activities or just cuddling on the couch after a long walk.